Tennesseans Are Enjoying Increased Property Values! If you own a home in Tennessee, GREAT NEW$$$ for you. Your home has probably increased in an amazing way over the last 5 years. Take a look at this graphic. Want to know for sure? Call me and I can get you real, up-to-the-minute data on your specific property. Not a bunch of fluff, and I do it FREE of charge. Also, can I ask you a favor? Do you know anyone who is looking to buy or sell? Would you please direct them my way? I'd appreciate it. My business is made up of referrals from friends, family and associates. I pride myself in providing service that you won't find with just any realtor. By being affiliated with a wonderful company like Exit Realty, I have access to top-notch agents across the US and even in Canada. Download an App for ease of use. Search via city, county, schools or neighborhood. Draw a map and search within the mapped area. Click a button to request a showing. Communicate with a rep 24/7 and if it's 2am and they don't have the answer, I'll receive a message to contact you in the morning! Check it out ... Again, that's MaroneyRealEstate.com and if you don't want to register to use the site, please drop me an email and I'll register you myself. I hope you'll find the site as useful as I did when I first used it! The quote in this photo has always been a favorite since I wrote my high school senior report on Henry David Thoreau. (Yes, I remember. But don't ask what happened last month! LOL) I'm sharing this quote for two ladies who are working hard to get their career where they want it to be AND because it's a favorite quote of mine. Sometimes along the path of life, both personally and professionally, we can feel stuck, limited or not where we are meant to be. Sometimes it just takes time. VA Loans & A Link To More Info! Did You Serve? 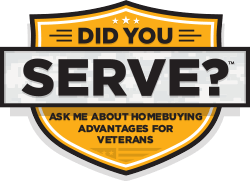 Let me help you get the MOST out of your VA Benefits when purchasing a home.